Ask a librarian for help with your library-related assignments such as research papers, presentations, and other projects. 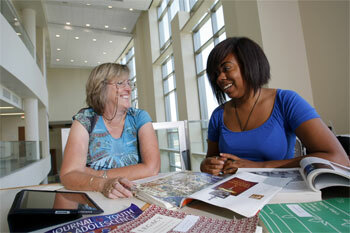 All students have a personal librarian based on program or area of study. Contact us for individualized help, subject-specific guidance, or to request a meeting or virtual appointment. Call us at (513) 745-4808, email askus@xavier.edu, or visit us at the Connection Center on the 3rd floor of the Conaton Learning Commons. Research help hours are Monday-Thursday 9:30am-5pm, Friday 11am-1:30pm, and Sunday 1-8pm. See the library hours for exceptions and holidays.